I am not crafty. There, I said it. However, I know lots of crafty people, including my sister-in-law and fellow blogger Corinne Gutstadt of @cleancraftbeauty. Corinne and I both became interested in “clean beauty” after becoming moms. Clean beauty describes products that are mindful of product formations, are environmentally conscious and produced without any proven or suspected toxic ingredients—many of these products you can make at home using ingredients that are already in your pantry. Being the crafty person that she is, Corinne took it to another level by creating some of her own clean beauty recipes. We recently did a Facebook Live video that you can watch HERE! 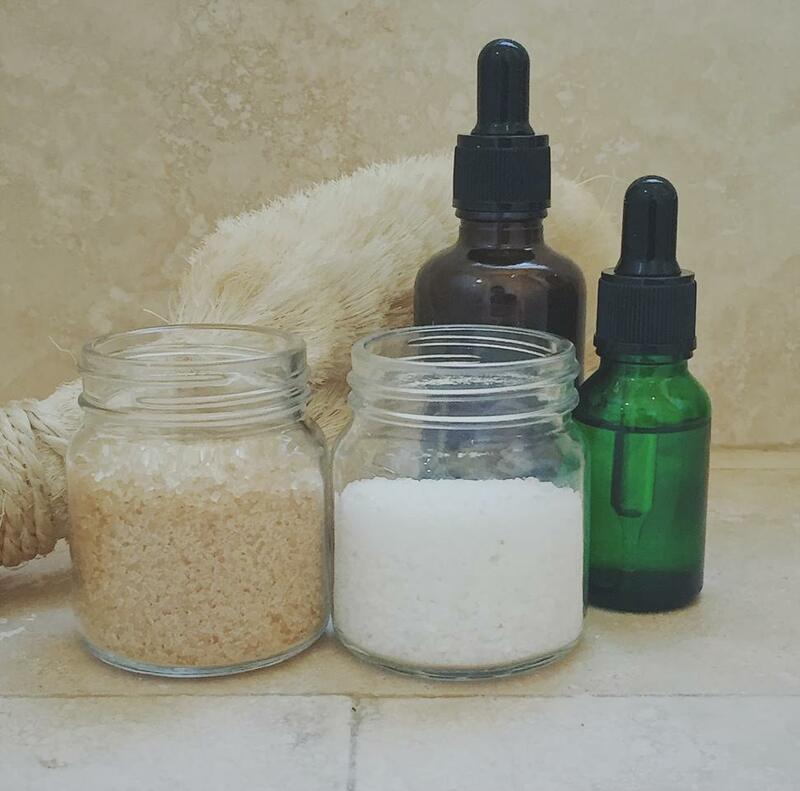 Below are the recipes for the two products we made in the video, a body scrub and bath salts. They are so easy to make (I happily discovered), are completely clean, cost efficient and you can customize them with essential oils that you love. Not only are these perfect for you, but they make amazing gifts for friends, colleagues and even your kids’ teachers. Scrubs are something that you really don't need to buy. It's really no secret what's in them, and in their simplest form they have two ingredients: an oil part and a scrubby part, typically either salt or sugar. Even advanced scrubs take just a minute to concoct and most people have everything they need to make them in the kitchen already or can easily get them next time they pop over to the grocery store. A good morning scrub can be a great way to wake up your body and start the day with your skin feeling exfoliated, moisturized and nourished. Possibly only second to dry-brushing (we'll talk about that another day), it is also a great DIY way to stimulate the lymph system and keep the crap from getting too comfy in the far corners of your body. I keep everything I need on hand in the bathroom to mix up a quick scrub when the mood strikes. Half of the battle here is being ready when you find a small moment to add this to your day. Put your favorite ingredients and everything you need into a little basket, including a small mixing bowl and a mixing tool, fork, spoon, chopstick, toothbrush, whatever you've got handy. Once you have the ingredients and tools, a basic scrub is super easy, half scrubby part and half oil... That's it! Mix the ingredients, scrub down, then rinse and wash the mixing bowl using whatever soap is in the shower so it's ready to go for the next time. So many scrubs to choose from! There are as many combinations of scrubs as you can think of. Below are a few good options to get you started. For a made-to-order “scrub buffet,” I like to stick to oils that are already liquid at room temp. You can pre-make small batches of scrubs using butters and there are a bazillion recipes online for those, but that requires a little business in the kitchen and shelf life concerns, so I like to save that time and keep this a bathroom-only activity. Coconut Oil: For a made-to-order scrub I prefer to buy fractionated coconut oil because it's already liquid at room temp. You can always toss it in the microwave for a few seconds to make mixing it all together quicker, but again, I try not to leave my bathroom while I do this, but ya know, you do you! Coconut oil...I mean, what else can I say about the benefits of coconut oil— rich in nourishing fatty acids and vitamins, this super moisturizing, anti-fungal, anti-bacterial, anti-aging, sun-protecting super oil is one you almost can't go wrong with. Good for your body, inside and out. This one is organic if that's your jam. Jojoba Oil: This one is great for putting back all the good stuff that our skin needs which gets stripped away every time we cleanse our skin. Our skin naturally produces this 'sebum' and it’s a good thing. Unfortunately, when we clean away the dirt we lose this necessary layer as well. Jojoba oils help build that layer back up and prevent the skin from drying out as a result of cleansing. Olive Oil: Known to be another highly moisturizing oil and a great anti-oxidant, olive oil is a great option for a scrub. High in properties that heal and protect the skin, it's also one of the cheaper, more readily accessible oils. It’s also a great swap for traditional shaving creams, so a good thing to have hanging out in your bathroom for a couple reasons! Salt: Anything with a coarse grain works, but for extra mineral benefits go with Dead Sea salt and Himalayan pink salt. They are packed with lots of good stuff, not the least of which is magnesium, which we all need more of. Certain salts can draw toxins out through the skin and help with a long list of health issues, but to be honest the amount of time these are on the skin while scrubbing these benefits are limited. What you're really getting here is great exfoliating and lymph system stimulation. If you want to maximize mineral intake and health benefits though, do a bath soak right after—that'll do it. Sugar: Generally speaking, sugar is less abrasive than salt, so if your skin is sensitive this might be a better option. Turbinado sugar is a great option, so is regular ol’ brown sugar. These both have slightly larger crystals and are softer, too, therefore gentler than regular white sugar. But really any sugar will do. Sugar also has humectant properties, which is fancy talk for it helps the skin draw in and retain moisture. So if your skin is feeling dry, sugar might be a better option that day. Essential Oils: This is so personal and really depends on the time of day you are doing your scrubbing. Lavender, tea tree, rosemary, thyme, cypress, rose, rose geranium, neroli, frankincense, lemon and orange are all favorites of mine to use in scrubs. The one thing I will say if you are doing this in the morning is to caution against using some citrus oils. Full therapeutic-grade cold-pressed citrus oils (Bergamont, orange, lemon, lime, etc.) can accelerate the effects of the sun and you can end up with a bad sunburn. Look for “steam distilled” citrus oils or eliminate completely if you aren't sure. This is a great resource for essential oils as well as sun-safe citrus oils. Oat Flour or Colloidal Oatmeal: Great for soothing irritated and dry skin. Add to a sugar scrub to maximize moisturizing, soothing effects. Rice Flour: Great for mixing up a finer grain scrub for use on the face. Sugar and salt can both be a bit abrasive and rice is a nice neutral ingredient that is less abrasive and great for a morning face scrub. Mix with any of the oils above that you love or mix some right into your morning cleanser. Coffee Grinds: The same way caffeine wakes you up on the inside, throwing some coffee grinds in your scrub can help stimulate blood flow to the skin and reduce cellulite...OK, not so sure I'm totally buying that but what-the-hey!! Worst case it's gonna exfoliate and it just smells good, too. For Jedi-level coffee scrubbing, find grinds with super high caffeine content. So go nuts (or nut-free, if you're allergic). You really can't go wrong here. I like to combine oils and then alternate between salt and sugar depending on how dry my skin is feeling or depending on the season. Here are a couple of suggestions to get you started. Follow with spraying of your favorite soothing Hydrosol. Disclaimer: I'm not a doctor, so the official position at CCB is to please consult your doctor prior to doing anything to your body—ever—especially if you are pregnant or breastfeeding. Bath salts are a super easy thing to DIY. Doesn't require any sort of cooking, measuring, chemistry knowledge or skill. Besides being good for your mental health—just stopping and taking some time for yourself alone has so many benefits—the benefits to your body and overall physical health are another lesser known upside to this wonderful habit. The trick is understanding what all the ingredients are and what they do so you can create a fun custom experience for yourself! Ready? Say ahhhhhhh! To keep it easy and not too time consuming, what I like to do is have a little buffet of all the ingredients in my bathroom on standby but not ready mixed. When it's bath time, I just pull out my buffet o’ fun and toss in what I need most that day. I fill up large containers with my "ingredients" and use those little scoops that you get with protein powders—I seem to have a thousand of them lying around. Below is the gist on the most popular options for custom-made bath soaks. Epsom Salts: Not actually salts but a mineral compound of magnesium and sulfate. Magnesium is vital for so many functions in our bodies and many people are magnesium deficient. Magnesium absorbs readily through the skin, so soaking in a bath amped up with magnesium is a great way to get this vital mineral into your system. Magnesium can soothe sore or cramping muscles, helps with muscle and nerve function, blood flow and can even relieve constipation. Both magnesium and sulfate support the function of insulin, which can help manage risk of diabetes and regulate blood sugar. What?! Yay, Epsom salts! Up to 2 cups of salts in large bathtub, soak for at least 12 minutes in a medium warm (not hot) bath for maximum benefit. These do the trick just fine. Dead Sea Salt: Since ancient times the ironically named Dead Sea has been famous for its health improving powers. I mean, if they aren't good for you then I need the name of their PR firm. From healing skin ailments and anti-aging benefits to soothing sore muscles, arthritis and allergies, many have sworn by the miracles of the mineral composition of the Dead Sea. Countless people have flocked there to cure what ails them. But guess what—you don't need a passport, you just need an Amazon account and bathtub. The mineral composition of Dead Sea salt is different than Epsom salt, and it’s all useful stuff so I always use both for a well-rounded soak. Himalayan Pink Salt: Similar to the other salts but again with a slightly different mineral composition, Himalayan pink salts are a great choice for a bath soak. Known to have equal or better detoxing benefits than Epsom salts, they also have the same antiseptic/antibacterial properties as the other salts, and also aid in relieving sore muscles, skin ailments and bloating. Himalayan salts help with sleep, so nighttime is a good time to use these magic crystals. Also interesting is that Himalayan salt helps the skin maintain its protective barrier and hold in moisture, so you won't get all pruney when you soak! If you're going for the full schamazzle soak, may as well chuck some of these in there, too. Any portion of your salt amount, up to 2 cups. These are great! Magnesium Flakes: When we are stressed out we use up our magnesium reserves faster, reserves that are already likely depleted because magnesium is a mineral that is dwindling in our diets and hard to absorb through the gut. Adding a boost of magnesium flakes to your bath can upgrade your magnesium intake during super stressful times, or anytime for that matter, and ensure our stress-ravaged bodies are operating at optimal performance. Did I mention magnesium is important? It really is. Substitute part of salt amount for magnesium flakes, up to 2 cups. Apple Cider Vinegar: There are some vitamins and other stuff in apple cider vinegar, but what I like about throwing it in the bath is that it helps balance the pH of the skin. Our skin is supposed to be slightly acidic and functions optimally and looks best when it is. ACV helps get the skin back to a more acidic pH. It also has antibacterial, antifungal properties as well, so it can be helpful with body odor management, skin infections, irritations or do a super concentrated foot soak and cancel out that questionable pedicure. 1-2 cups and soak for at least 20 minutes. Baking Soda: Baking soda has been known to have detoxing effects. Because of its high alkalinity it can be a great relief for things like urinary tract infections, hemorrhoids, yeast infections, bug bites and smelly feet. Seems the little buggers that cause all that unpleasant stuff don't like an alkaline environment. So a bit of science here: baking soda works well alone or with salts. If you're going with baking soda, skip the apple cider vinegar as that would cancel out the effects. I would and DO alternate between baking soda and ACV if the need arises or the mood strikes. Up to 2 cups of baking soda can be added to your bath for ultimate detoxing benefits! Bentonite Clay: Also has some amazing detoxifying properties. Put on wet skin and leaving it to dry can pull out toxins, bacteria and oils from the skin. Also, due to the ionic composition of the clay it can pull heavy metals out of the body—not sure how that works but sign me up! On top of that, Bentonite Clay is packed with minerals and nutrients including calcium, magnesium, potassium and iron! Put 3-4 tablespoons into your salted bath and/or do a face/full body mask by mixing with equals parts water add a couple drops of your favorite skin nourishing essential oils, make a paste, spread all over, let it dry and then hop the tub to rinse and soak! Soak for at least 12-15 minutes in a medium-warm bath while doing a Bentonite Clay mask and listening to a Headspace meditation. IMPORTANT: Hydration is SUPER DUPER important for flushing all the sludge from your system. So make sure you hydrate before, after and during your bath and really reap the full benefits from your bath buffet. Get a big jug of water, throw in a couple drops of lemon essential oil, breathe, relax and ENJOY!